Please note that this post is sponsored (or invited by the restaurant), ratings will not be available as a result. However, comments do reflect our true opinions. You truly cannot go wrong with ordering guac and salsa at a mexican restaurant, it is the building block to any great restaurants. This restaurant showcased great foundation of their work in freshly made guacamole, salsa and chips. All freshly made. The salsa has a good mixture of sweetness with spiciness. The chips are crunchy with traditional, plain flavor for the enjoyment of the assortments. My personal favourite. Somehow I have been having beetroot these few days multiple times, so I came to the conclusion that restaurants are now slowly pushing out this otherwise not-so-popular food as a trend. Beets are indeed healthy but a lot of people dislike the earthy-stain it has. Brickhouse opted to deep-fry their beet as to remove this unpopular stink. They have succeeded and with their sauce (Aioli that contains garlic and olive oil) , they are married into the perfect combination of spiciness. (not that spicy) The sauce itself is way spicier (I suspect they used more of a chili base), and therefore the color is more of a yellowish one. The barramundi or Asian sea bass is a species of catadromous fish in family Latidae of order Perciformes. The species is widely distributed in the Indo-West Pacific region from Southeast Asia to Papua New Guinea and Northern Australia. Though it has less omega-3s than most salmon, it’s still a very good source, especially compared to some other white fish, like cod and tilapia. Like other fish, it is also a good source of protein and contains nutrients like vitamin D and potassium. Honestly I do not enjoy having fish unless they are raw (sashimi). Barramundi is also something that you do not come across a lot when you cook at home (we eat salmon mostly). However, this is a truly special dish as it lies within the borders of an Asian-Mexican fusion. The fish itself does not reek of fish, it is smooth on the outside, tender on the inside. The leche de tigre (or the tiger's milk) is used part of the sauce that gives the dish a sour, lime taste. The sauce does contain chili as suggested by our head chef, but nonetheless it is made that it only has a hint of it at towards the end of the bite. Basically cheese in the middle, greens on the sides. What's unusual is the use of green tomatoes, giving it a slight sour taste to the otherwise heavy and thick taste of the mozzarella. This is the only taco I had out of the other 5 selections when ordering the taco platter. The chef does explain that this is the most popular dish and I can totally understand why after consuming this in a few bites. The pork belly has some pastes of achiote (a kind of Central America, Mexico spice), that gives it a slight mild flavor thats musky and peppery. It distincts with the smooth and fragrant bacon aioli and salsa. Chicken was flawless with tenderness. The green mole does show a lot of preparation work by the chef, so kudos to him. The green mole was made fresh. I'm not sure what the ingredients are included here but typically it should include: pumpkin seeds and tomatillos mainly with lettuce cilantro, onion, garlic and chiles, giving it substance and its underlying nuttiness. The slaw, decent, but in my opinion not required. No idea that such toast exist and it taste somewhat similar to French Toast, but a tad bit harder (but not stone-hard). Not entirely sure if it should be classified as a torrejas (basically the latin-cousin of the French Toast), as the legit torrejas should be manufactured mainly with honey and cinnamon syrup. French toast hails from France, but surprisingly, its origins are in ancient Rome, of all places. It soon became popular throughout Europe, where it acquired the name “pain perdu,” which means, “lost bread;” this is where the suggestion to use “lost” or stale bread comes from. The first mention of “French toast” may be traced back to a 1660 cookbook called The Accomplisht Cook. References to torrejas (or torrijas) date back to the 15th century. Originating in Spain, torrejas are a traditional recipe used to celebrate Lent and Holy Week. The recipe was introduced to the New World by conquistadors and missionaries, and became a great way to enjoy a family meal during Lent without having meat. But they’re also popular year-round as sweet treats or brunch options. The word torreja means “thin slice,” since the bread was thinly sliced before being soaked in the traditional mixture of egg and cream. 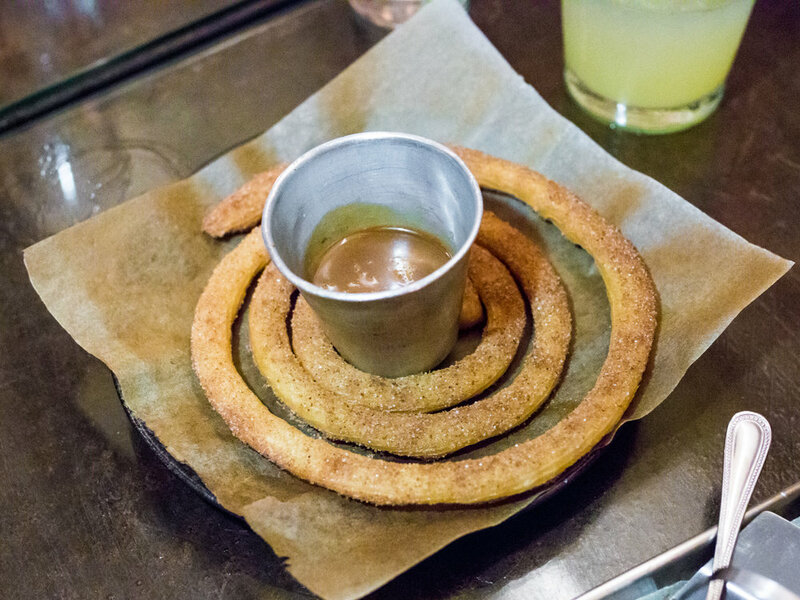 Last but not least a meal does not end unless churros are served. Self-explanatory and fool-proof, it is therefore safe to say the meal is well concluded. This place is pretty hard to find, but it does give the place a unique sense of mystery and adventure. Much like Mexico, it is tucked away in the mysteries of the concrete jungle -- central (also alluding to Central America hehe). The hint for you is that the entrance is near Milan station. The alley is very ratchet so do not scream if you see a mouse or cockroach. However, deep into the alley (not that long actually) you will hear music playing, people socializing and a familiar scene with alcohol. On that note I did try one of the alcohol but I'm really no expert of it. I drink and I get drunk. That being said, the entire atmosphere is fun and chill, great for pre-party drinks with your obnoxiously loud and thirsty friends.